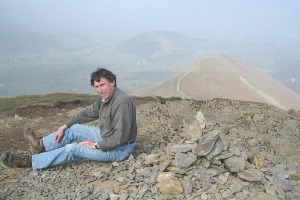 I have lived in the Cumbrian town of Sedbergh since 1998, having spent my childhood in Kent, and most of my early adult life in or near Manchester. I was educated at Bradfield College in Berkshire, and then at UMIST (now Manchester University) where I took a degree in French European Studies and Maths, learnt how to make curry and began to get acquainted with the fells and rivers of northern England. After graduating, I worked for a few months as a political organiser and election agent. I then spent a year as an advertising space salesman, cheese maker, hospital porter and cab driver, before starting what turned out to be several years work in radio, mostly with BBC Radio 4 and BBC Radio Scotland, on magazine programmes such as You and Yours, Good Morning Scotland, Woman's Hour and Countryside in Spring. In the mid nineteen–eighties I took a PGCE at S.Martin's College in Lancaster. Despite this experience, I went on to teach Graphic Design, German and French at schools in Tameside, Greater Manchester. I also taught English as a foreign language to adults and children in England, Iceland and Denmark. On giving up full–time teaching I returned to the media, but this time as a writer, photographer, translator and website designer. Download / print an A4 leaflet about the various media–related services that I now offer. I am a member of the Society_of_Authors and the Translators'_Association.